A 45 minute drive from Baños direction Puyo starts the best rafting in Ecuador on Pastaza river. 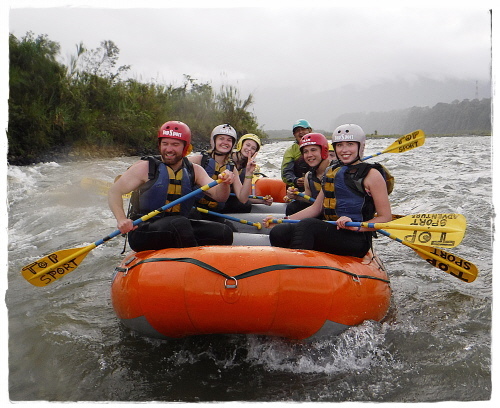 White Water Rafting class 3 promises great fun and our certified guides assure a safe ride. As half day activity you can choose when to go for it - 9 am or 2:30 pm. You will be equipped with a wet suit, shoes, helmet, life jackets and a paddle. For getting prepared you will receive a small technical introduction from our guides and you will practice some important manoeuvers in calm waters. One of our safety kayakers always accompanies the rafts during their approximately 90 minutes ride. We'll also take plenty of breath-taking pictures of you, so that you can easily share what you have experienced with your family and friends. Once reaching the end of the route you'll either enjoy a small lunch or snack before heading back to Baños. You want more difficulty or a longer ride? Just get in touch - we arrange everything for you individually, based on your wishes and current conditions on our adventurous white waters. Experience the route of the waterfalls really close: 3 of our precious waterfalls here in Baños de Agua Santa offer the perfect scenery for great canyoning adventures. From the top of a cascade we go downwards - with different rappelling or abseiling techniques we make it from the top to the bottom. This fun activity can be arranged as half day tour or day tour. Depending on individual wishes and considering current water and climate situation we choose the best venue for you and your friends. Our certified guides as well as state of the art equipment will make this canyoning trip a memorable part of your holidays. The standard package includes: transport, certified guide, wet suit, helmet and other technical equipment needed as well as pictures. In case of full day tours a lunch box is provided. Cascades: Chamana, Rio Blanco and Cashaurco. 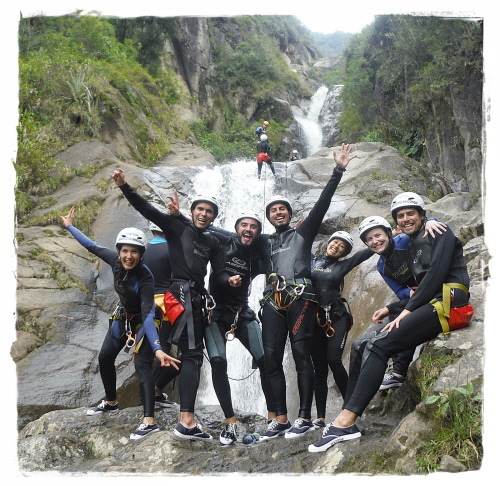 Enjoy Baños' waterfalls, exciting slides and refreshing baths during your canyoning adventure.